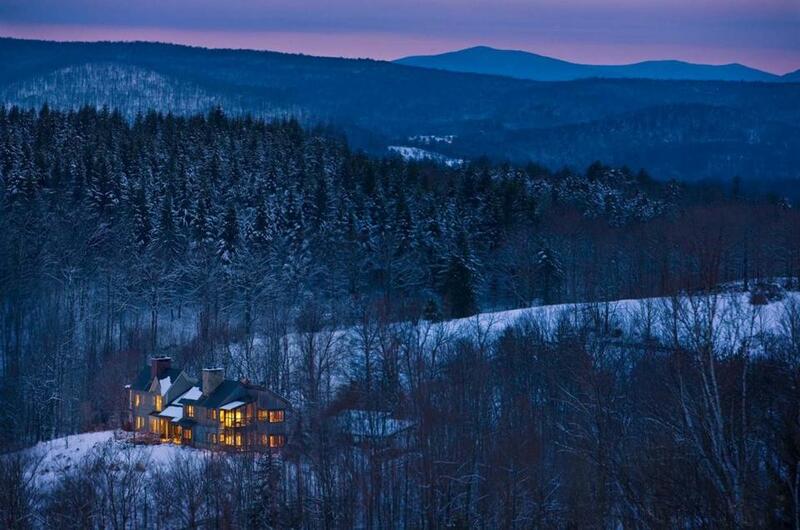 Twin Farms, a hotel and spa on 300 acres in Barnard, Vt., with its own ski trails, restaurant, spa, and luxurious range of accommodations. There’s nothing like the feel of slicing through fresh snow, crisp air in your lungs, cheeks frosty pink from the thrill of it. Yes, there’s nothing better — until later, when you are sore and freezing. Then there’s nothing like soaking in a mountainside hot tub, sipping a hot toddy by a crackling fire, or digging into a home-cooked meal. You can get it all in Vermont. Ever wondered what would happen if you took a gorgeous old Vermont farmhouse barn — warm wood, exposed beam, brick chimney fireplace, and balcony view of the snow-covered nearby village — and added a hot tub, personal masseuse, marble bathrooms, and gourmet farm-to-table fare? You’d get something like Pitcher Inn in Warren. The luxury inn offers two suites in the barn and nine guest rooms in the main house, all of five minutes from mountain skiing at Sugarbush and 15 minutes from Mad River Glen. You’ll also have complimentary use of the inn’s snowshoes and sleds, and access to the Sugarbush Health and Racquet Club, which offers a Jacuzzi, sauna, and lap pool. Rooms are themed to reflect the estate’s rural surroundings: “Trout” has a comfy tree-trunk bed carved with fiddlehead ferns, private porch over the trout-filled brook, birch-framed mirror, and an antique marble vanity. “Ski” is complete with lift-ticket booth, original trail maps, vintage signs, ski memorabilia, and a steam shower with inlaid compass, while “Hayloft” is furnished with leather club chairs by the brick fireplace. Refuel at Pitcher’s 275 Main, with its 500-bottle wine cellar, a la carte farm-to-table dinner menu, a kitchen serving local meats, fresh seafood, Vermont artisan cheeses, and local produce. 275 Main St., Warren. 802-496-6350, www.pitcherinn.com. Starts at $350 per night for rooms, $700 for suites. The rustic-yet-decadent Twin Farms is an all-inclusive, five-star luxury hotel and spa with private downhill ski trails on the property, miles of private woodland trails for snowshoeing or cross-country skiing, and a skating pond, all nestled on 300 acres at the foot of the Green Mountains. Its five groomed downhill trails on a nearby mountain are ski-in-ski-out and closed to the public. Staff will bring you back up in a snowmobile after each run. Twin Farms can also arrange for your transportation and tickets to Killington, about 45 minutes away. So go outside and play — all equipment is free to use on-site — and when your goose is cooked, head inside for a harvest-style buffet lunch, from game bird and fresh fish to hot soup and salads. Fare is farm-to-table and includes the estate’s home-grown vegetables and herbs. Cocktails and canapés are served each evening before dinner, and wine connoisseurs can select from the 26,000-bottle wine cellar. Relax at the estate’s Bridge House Spa, which houses a glass-brick steam room and Japanese-style soaking tub. Warm up by a crackling fire with a hot toddy, browse the art gallery, or have a drink in the hotel’s pub. Stay in either a guest room or private cottage, each with a fireplace and screened porch. 452 Royalton Turnpike, Barnard. 802-234-9999, www.twinfarms.com. Starts at $1,450 per night (adults only), all meals and drinks included, no tips or fees. 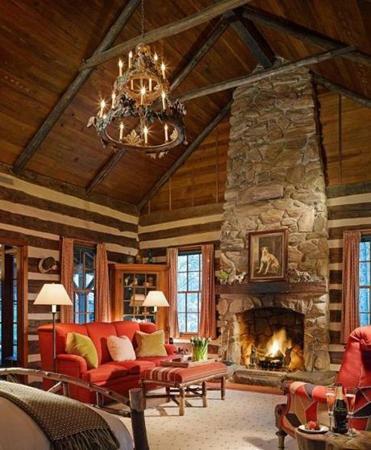 In Log Cabin (above) at Twin Farms, there’s a river rock fireplace and intricate twig work. 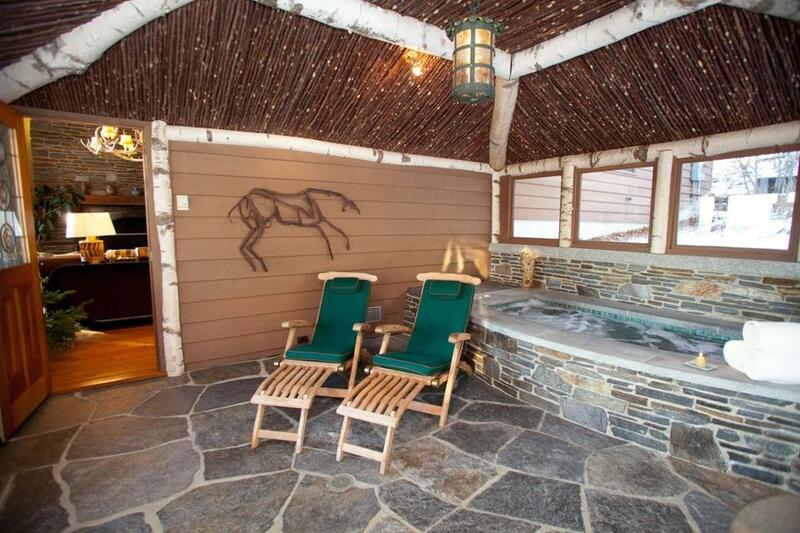 There’s a hot tub on the porch at Twin Farms’ Chalet. Castle Hill Resort and Spa in Ludlow is pretty much exactly that — a castle. On a hill. With a spa. The historic Tudor mansion overlooking Okemo Mountain looks out of a fairy tale. After a day skiing Okemo, about a 10 minute drive, unwind in Castle Hill’s spa, housed in a historic converted carriage house. Soak under the stars in an outdoor hot tub. There’s a turn-of-the-century vibe in the candlelit wood-paneled dining room, where sample three-course prix fixe menu items include steamed Prince Edward Island mussels sauteed with chardonnay, French onion soup au gratin with Cabot cheeses, and cider-glazed cedar-plank Atlantic salmon fillet with lobster risotto. At the junction of Routes 103 and 131, Ludlow. 802-226-7361, www.castlehillresortvt.com. Rooms from $169 per night. Stowe Mountain Lodge is a ski-in-ski-out luxury hotel, just feet from the beginners’ area at Stowe Mountain and a five-minute gondola ride to more advanced runs. After a day on the powder, head back for a soak with a view in the outdoor Jacuzzi. Spa includes sauna, steam room, indoor Jacuzzi, and a sanctuary lounge for massages. Stay in a guest room, studio or suite, which can include full-service kitchens, separate living room area, Simon Pearce dishware, stone-framed fireplace, marble-finished bathroom with relaxation tub, washer-dryer, and private outdoor terrace. Dine upscale at the on-site Solstice Restaurant or casually at the Hourglass Lounge, where you can grab a burger, house pizza, or local beer. 7412 Mountain Road, Stowe. 802-253-3560, www.destinationhotels.com/stowe-mountain-lodge. Rates change by the day. The picturesque Woodstock Inn and Resort in Woodstock has its own mountain, called Suicide Six, with some 24 groomed runs, about four miles from the resort. Take a shuttle there for skiing or snowboarding, or take a quick shuttle for cross-country and snowshoeing trails. Afterward, book an on-site spa massage or facial and use the hot tub, steam room, sauna, and waterfall shower. Stay in a guest room or suite, some with their own fireplace, or book the four-bedroom Morgan House. Wake to breakfast at the resort’s Red Rooster for thick-cut cinnamon French toast, chocolate chip buttermilk pancakes, golden Belgian waffles, or Woodstock Benedict eggs with apple-smoked bacon. 14 The Green, Woodstock. 888-338-2745, www.woodstockinn.com. Rates change by the day.